Over the years, I have learned that many stories in the Bible have a surprise ending if you look for it carefully. The story Jesus told about the Prodigal Son is no exception. You can read the story for yourself in Luke 15:11-32. The real surprise comes at the very end of the story, so you have to wait for it. I’ll show it to you in a minute. As we read the first part of this story, we may assume that it is mostly about a wayward son. Later, though, we learn that’s not the main reason Jesus told the story. Jesus begins by telling us about a rebellious son who despised his father so much that he asked for his inheritance early. That was like saying that he couldn’t wait for his father to die so he could get his money. How disrespectful! In spite of that, his father graciously gave him his inheritance early. This young man took the money and ran away from home. While he was far away from home, he wasted his father’s hard-earned money on prostitutes and wild parties. Eventually, the money ran out. If that wasn’t bad enough, a famine hit the area at the same time. This young man couldn’t even buy food so he soon became really hungry. His so-called “friends” who had partied with him disappeared and no one would give him anything—remember there were no SNAP programs back then. The only work he could find was feeding smelly pigs. He earned so little money that the food the pigs were eating began to look pretty good. It was only then that he came to his senses. He was starving, but he remembered that the employees who worked for his father always had plenty to eat. He knew he wasn’t worthy to be treated as a son, so he made the decision to humble himself and return to his father and ask for a job. The foolish young man repented of his sinful ways and came back home. That’s a heartwarming message, but that is NOT the whole reason Jesus told this story. The next part of this story reveals the father’s loving heart (and even that is not the main reason Jesus told the tale). When the wayward son got close to home, we learn that his father was looking for him. When the father saw him coming down the road, he ran to meet him, embraced him (even though he reeked of pig slop), and welcomed him home. The father wouldn’t hear of having his son back as just an employee. This was his SON, so he gave him the best clothing he had and reinstated him in the honored position as his son. The father organized a great feast and invited everyone to come and celebrate his son’s return. He ordered his employees to “‘bring the fattened calf, kill it, and let us eat and celebrate; for this son of mine was dead and has come to life again; he was lost and has been found.’ And they began to celebrate” (Luke 15:23–24). That portrait of a father’s love for his son is a beautiful illustration of God’s love for those who repent of their sins and humbly ask God for His forgiveness. This reminds me of God’s promises to those who humbly submit to Him. Here are two examples of what happens when we put our full trust in the Lord: “The Lord your God is in your midst, a mighty one who will save; He will rejoice over you with gladness; He will quiet you by his love; He will exult over you with loud singing” (Zephaniah 3:17). “Therefore, if anyone is in Christ, he is a new creation. The old has passed away; behold, the new has come” (2 Corinthians 5:17). Even though Jesus did draw attention to the power and glory of His undeserved forgiveness, that is not the ultimate reason He told this particular story. Luke’s Gospel reveals what prompted Jesus to tell this story in Luke 15:1-3. Jesus was spending time with, and even having meals with, broken and sinful people. This offended the strict religious leaders, and they began to complain. They believed that good people should have nothing to do with those whose lives were filled with sin, like the prodigal son. “So, [Jesus] told them this parable…” (Luke 15:3). 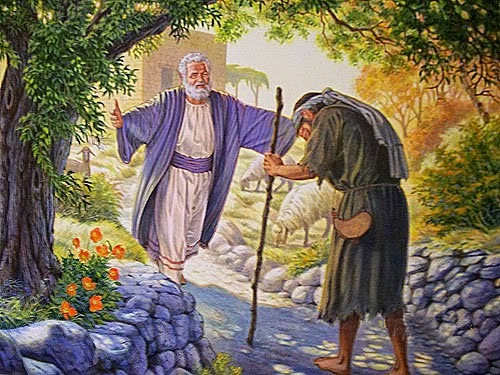 The story of the Prodigal Son is not primarily about the wayward son or even about his loving father. The main reason Jesus told this story was to confront the snobbish religious leaders and invite them to admit that in spite of their religion, they needed forgiveness, too. Now let’s go back to Jesus’ story. The celebration for the wayward son’s return was in full swing. The party included loud music and dancing. The older son came back from working in the field, heard the commotion, and was told what was going on. Instead of joining the party, he got jealous because they were celebrating his brother’s return instead of appreciating his many years of hard work. Here comes the surprise ending. The father heard that his older son was refusing to come to the celebration, so he left the party, found his older son, and invited him to join the festivity. The father explained to him that they “had to celebrate and rejoice, for this brother of yours was dead and has begun to live, and was lost and has been found” (Luke 15:32). What happened next? Did the older son humble himself and rejoice in his wayward brother’s return or did he continue to protest his father’s love and grace? We don’t know. Jesus left the invitation open. That same invitation is open to you, too. You can choose to trust that your own goodness is enough to impress your perfect heavenly Father, or you can humbly admit your own lack of holiness and surrender to Christ’s offer of love and forgiveness. “God demonstrates His own love toward us, in that while we were yet sinners, Christ died for us. Much more then, having now been justified by His blood, we shall be saved from the wrath of God through Him” (Romans 5:8–9).